Basic Authentication Policies are now a deprecated feature. Basic Policies are applied to everyone accessing a vServer, there’s no granular control – just on and off. The RFWebUI does not work with this integration. nFactor is way more fun. I wanted to take this a a bit further though. One of the strengths of nFactor is the ability to create different authentication requirements based on a user’s group membership, source ip, client type…anything you can think of a policy for. This lets us have a single vServer (Web, Gateway, etc…) that’s still able to accommodate a variety of authentication methods. I’ve also noticed that there aren’t any end-to-end examples of configuring this type of setup. I’m going to attempt that here. All users are prompted for Active Directory credentials. 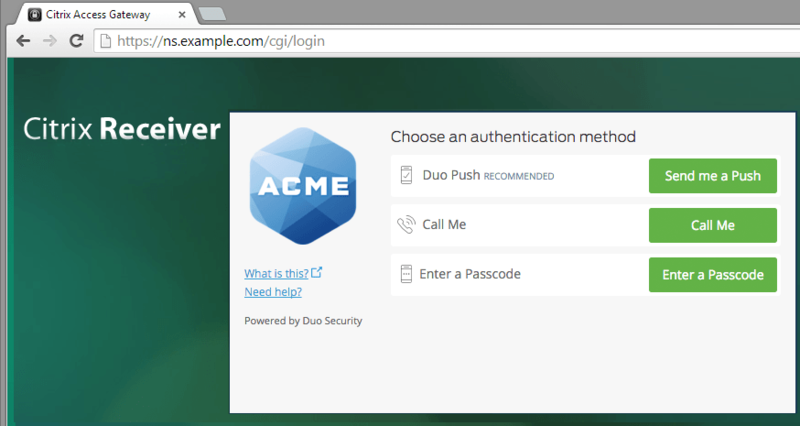 Members of a specific AD group will be prompted to select a Duo prompt method, then Duo authenticated. If the client program is Receiver or the NetScaler VPN client, the prompt will not be shown and push will be used instead. This is because Receiver and the NetScaler VPN client do not support displaying nFactor login screens (yet…). Non-group members will be logged in with only AD credentials. This configuration will be done in the web GUI instead of the command line. Also, in this example we’re building things from the bottom up. Actions > Policies > Policy Label > etc… This minimizes the amount of moving back and forth between modules. But, it can make it hard to understand why we’re doing certain steps. I recommend reading the entire process to see how it fits together before doing it. Active Directory account to use as a LDAP bind account. You will need the Distinguished Name (DN). Create (or pick and existing) Active Directory group that will contain the 2 factor auth enabled users. Retrieve your ikey, skey and API host from your Duo account. Choose a RADIUS secret password. 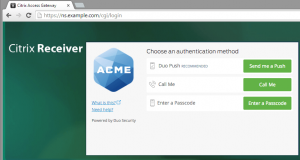 First, we’ll configure the Duo Authentication Proxy. This is going to act as a RADIUS server for the NetScaler. In this configuration, we’ll configure three different RADIUS servers (ports) on the proxy. 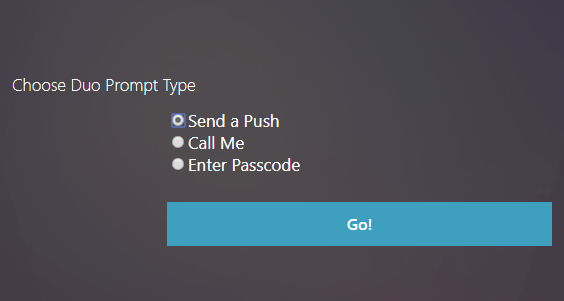 When called, each will produce a different Duo prompt for the user (push, call or passcode). Note that in this example, we’re using a single Auth Proxy server. For a production configuration you should consider creating two (or more) and load balancing them with a LB vServer and appropriate monitors. Now restart the Duo Authentication Proxy Windows service and make sure it starts back up. If it refuses to restart, there is a mistake in your config file. The authproxy.log file will have clues where to look. Next, we’ll create the actions for our authentication sources. Now, we’ll build the authentication policies that will be bound to the Policy Labels. Navigate to Security > AAA- Application Traffic > Policies > Authentication > Advanced Policies > Policy. Next, we need a policy for our three Duo methods. The html string these policies look for will be defined in our Login Schema in a few steps. This is the variable that’s set when the user selects a login method radio button. We also need a second version of the Push policy that only checks for group membership. This will be used when a Receiver or NetScaler VPN client connects to prompt the user without asking first. If you would rather the “default” action be a call, you can link to that action as well. Passcode cannot be used here since it requires user input. Since LDAP is the first authentication step, it will be defined directly in the AAA vServer and won’t need a Policy Label. We can skip that for now. Note the Action name in this screenshot differs from the settings below. Just a difference in my lab’s naming conventions. Note the Action names in this screenshot differ from the settings below. Just a difference in my lab’s naming conventions. Now we’ll create the AAA vServer that will handle the authentication requests. In this case, we’re going to use a non-addressable (0.0.0.0) vServer. All requests to the vServer will go through the Unified Gateway DNS address. The last thing we need to do is bind the AAA vServer to your Unified Gateway. Navigate to NetScaler Gateway > Virtual Servers and click on the Unified Gateway vServer. Remove any existing Basic Authentication policies or Authentication Profiles. Click the pencil icon on “Authentication Profile” and choose nFactor-AAA. Click OK and verify the profile is bound. Keep in mind that if you’re using Unified Gateway to login to Storefront, you’ll need a Traffic Policy to keep Single Sign On working.